Please follow the guidelines below so that everyone can enjoy the picnic area. Reservations will be required for Zone A(2). Reservations will be required to use barbecue spots in Zone A(2) (fee charging spaces). Reservations may be made starting at 10:00 a.m. up to one month in advance of the intended usage date, on the same calendar date of that month. Spots are available on a first-come, first-served basis. Saturdays, Sundays and National holidays in the end of March – November. No reservations are required for Zone B and Zone A(1). Zone B and Zone A(1) are free-use spaces that does not require advance reservation. Barbecue pit reservations will no longer be possible. Barbecue pits will be available on a first-come, first-use basis. In addition to the picnic area, you can use fire for barbecues, etc. within the designated areas. Observe the following so that everyone can enjoy the area. The use of fire is limited to the designated areas on the guide map. The use of fire outside the designated areas is prohibited. Ground and open fires are prohibited. 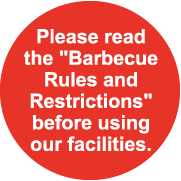 Please use an outdoor barbecue grill that does not transmit heat directly to the ground or tables. Any action that may damage the facilities or could cause accidents, such as using pegs or rope to setup tarps, is prohibited. Do not leave reserved spots unattended (by setting rope or spreading out sheets) or reserve more space than is required. If a spot is left unattended, articles may be removed. Hazardous materials, such as gasoline or propane gas and generators are prohibited. There are no places for disposing of trash and charcoal. Please take your garbage home with you. Extinguish any charcoal safely. Also, do not throw charcoal or oil in any waterways. Parking is strictly prohibited along the embankment road and in the surrounding residential areas. Please use the designated parking lot. Also, drinking and driving is strictly prohibited. Any acts that would cause an inconvenience to other users such as playing loud music, becoming drunk or fighting are prohibited.